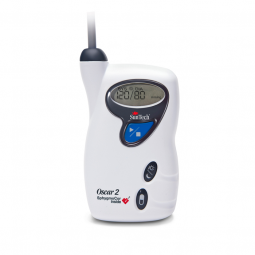 The Oscar 2 ABP Monitor is independently tested to meet the accuracy and performance requirements of the British Hypertension Society, the European Society of Hypertension International and the AAMI-SP10 standards. This system comes standard with both the patented Orbit™ ABPM cuff and interpretive software AccuWin™ Pro 4. The Oscar 2 24-HR Ambulatory Blood Pressure Monitor NOW features options to combine our patented motion-tolerant technology with the gold standard in central blood pressure and arterial stiffness measurement from AtCor Medical and a Bluetooth-connected patient diary mobile app called True24. AccuWin Pro 4 software: Efficient programming and analysis with advanced options provide powerful flexibility, so you get every data point. Bluetooth with True24: The True24 patient diary mobile app is designed to work with the SunTech Medical Oscar 2TM Bluetooth ambulatory blood pressure monitor during a physician prescribed ABPM study. Multi-language Accuwin Pro 4 Installation Guide. Notes to help with Mixed Mode installation of Accuwin Pro 4 software. Walks you through how to properly set up the SQL server. User manual for the new Oscar 2 (Model 250) & AccuWin Prov4. How do I register my Oscar 2? To register, please fill out the product registration card provided with your SunTech® Product. You can also register by filling out our online product registration form under the Products Section of this website. Does the Oscar 2 or its cables contain Latex? All of our products, including the Oscar 2, hoses and cables, do not contain any Latex. To turn ON, press and hold the start/stop button until you hear a series of 3 quick beeps. To turn OFF, press and hold the start/stop button until you hear a series of five beeps. Utilizing our ABP monitor - Oscar 2 or Oscar 2 with SphygmoCor Inside - the patient returns and these measurements are transferred to a computer where they can be easily viewed and documented in a report using the AccuWin Pro™ software. You are then able to see the full picture when it comes to assessing blood pressure and diagnosing hypertension in your patient. The results of ABP monitoring provide the most comprehensive representation of a patient’s complete blood pressure profile. When the complete picture is what you need, we are here to provide you with just that. Our ABPM devices don’t miss a step – so you won’t either. This video will go through what comes standard with the Oscar 2 Ambulatory Blood Pressure Monitor by SunTech Medical. This video will show how to install AccuWin Pro software on your PC. The AccuWin Pro software enables you to program the Oscar 2 for 24 hour or 48 hour ambulatory blood pressure monitoring studies. This video will demonstrate how to use the AccuWin Pro software to program an ambulatory blood pressure monitoring study for the Oscar 2 by SunTech Medical. 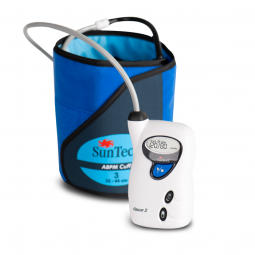 This video will show you how to apply the Orbit Blood Pressure Cuff and begin an ABPM study using the Oscar 2 by SunTech Medical. This video will demonstrate how to retrieve and analyze the data from an ABPM study using the Oscar 2 and the AccuWin Pro software.